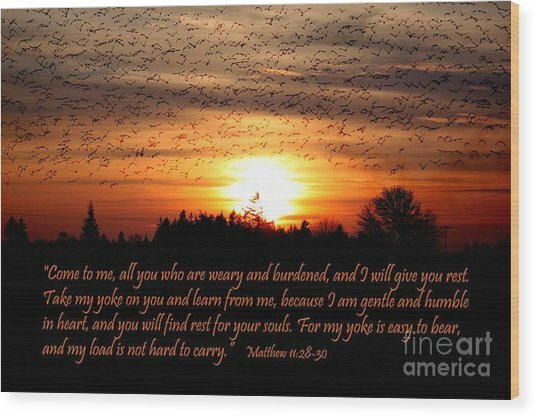 Rest In Him is a photograph by Erica Hanel which was uploaded on January 20th, 2013. I was fortunate to capture one of the largest flock of geese I had ever seen. 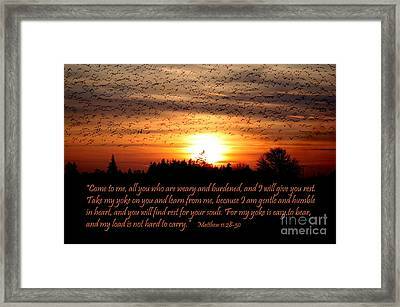 I blended that photo with a sunset photo and added the Scripture. Photos taken with Canon T1i and processed using The Gimp with Wacom Tablet. 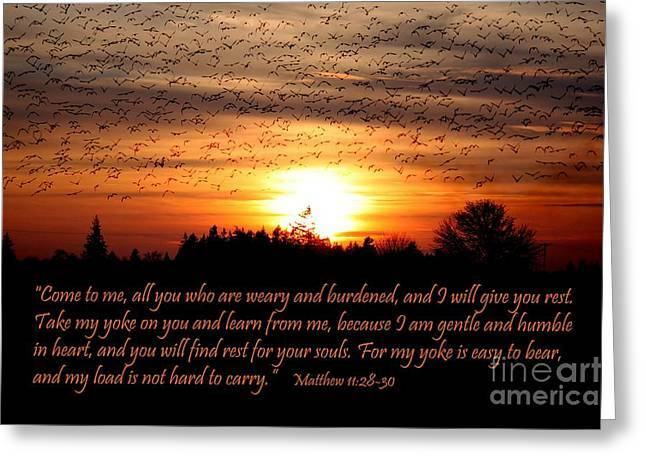 "What does it mean when Jesus says 'my yoke is easy and my burden is light' (Matthew 11:30)?" Answer: The phrase �my yoke is easy and my burden is light� is part of a larger passage (Matthew 11:28-30), in which Jesus tells all who are weary and burdened to come to Him for rest. He isn�t speaking here of physical burdens. Rather, it was the heavy burden of the system of works that the Pharisees laid on the backs of the people that Jesus was offering to relieve. Later on in Matthew�s gospel, Jesus will rebuke the Pharisees for laying heavy burdens on the shoulders of the people (Matthew 23:4). Jesus was saying that any kind of law-keeping is burdensome and amounts to a �heavy yoke� of oppression because no amount of law-keeping can bridge the gap between our sinfulness and God�s holiness. God says through the mouth of the prophet Isaiah that all of our righteous deeds are like a �polluted garment,� and Paul reiterated to the Romans that �no one will be declared righteous in his sight by observing the law� (Romans 3:20). 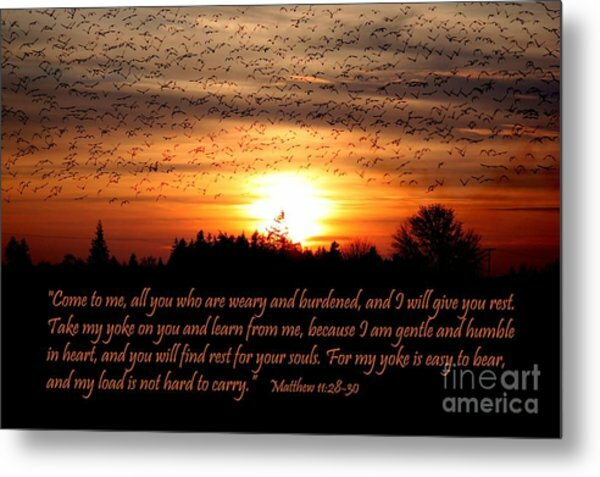 The good news is that Jesus promises to all who come to Him that He will give them rest from the heavy burden of trying to earn our way into heaven and rest from the oppressive yoke of self-righteousness and legalism. 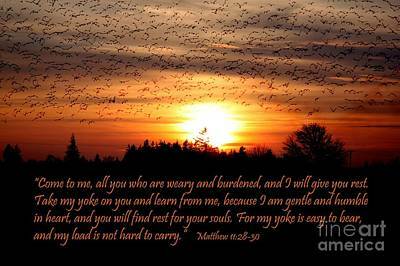 Jesus encourages those who are �heavy laden� to take His yoke upon them and in so doing they will find rest for their souls. The yoke of Jesus is light and easy to carry because it is the yoke of repentance and faith followed by a singular commitment to follow Him. As the Apostle John says, �For this is the love of God, that we keep his commandments. And his commandments are not burdensome� (1 John 5:3). This is what Jesus says in v. 30. 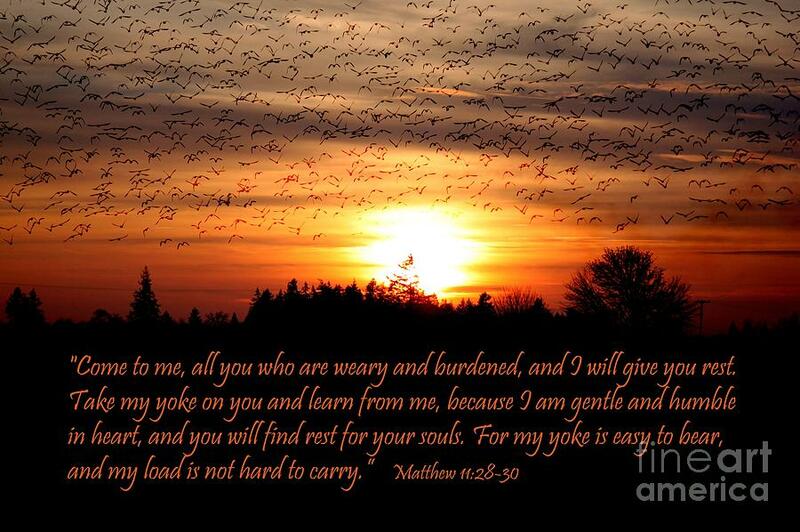 His yoke is easy and his burden light. Now, we might think that there is really no difference between the commandments of Jesus and the Jewish Law. Isn�t the same God responsible for both? Technically speaking, yes. If anything, one might argue that the commands of Jesus are even more burdensome because His reformulation of the Mosaic Law in the Sermon on the Mount (Matthew 5�7) actually goes above and beyond a mere outward conformity to the Law and deals instead with the inner person. What makes Jesus� yoke easy and his burden light is that in Jesus� own active obedience (i.e., his perfect fulfillment of the Law of God), He carried the burden that we were meant to carry. His perfect obedience is applied (imputed) to us through faith, just as His righteousness was exchanged for our sin at the cross (2 Corinthians 5:21). Our obedience to Jesus then becomes our �spiritual worship� (Romans 12:1). Furthermore, we are indwelt by the Holy Spirit who works in our lives to mold us into the image of Christ, thereby making the yoke of Jesus easy and His burden light. The life lived by faith is a much lighter yoke and a much easier burden to carry than the heavy and burdensome yoke of self-righteousness under which we continually strive to make ourselves acceptable to God through works. Incredible capture of this moment in time!! !